The patent on the first-generation Roundup Ready soybean trait expired in 2011, leaving the temptation for growers to save their own seed or purchase bin-run seed from others. However, using bin-run Roundup Ready soybean seed comes with agronomic and legal implications. Several years ago, Lange analyzed Manitoba crop insurance yield data comparing Roundup Ready varieties that would be obviously off-patent to a few of the most popular Genuity Roundup Ready 2 Yield trait technology soybeans currently grown and available only as Certified Seed. He found that the old bin-run seed yielded about five bushels per acre less than the new, most popular varieties. Possible reasons for the yield drag of older bin-run seed is the improvement of many important genetic traits over the past 10 to 12 years. 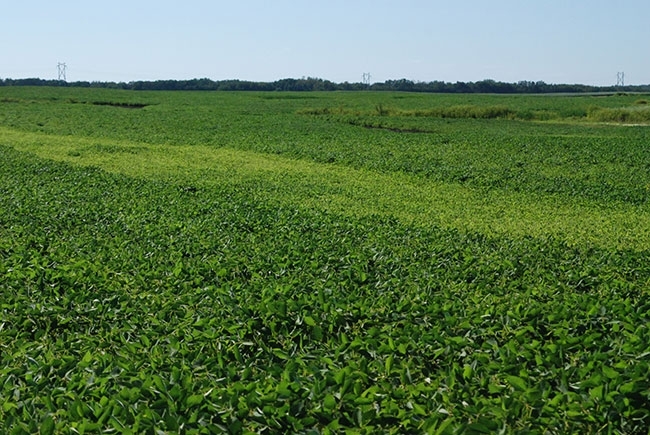 These include earlier maturity, higher yield potential, Iron Deficiency Chlorosis tolerance, and Soybean Cyst Nematode resistance. Lorne Hadley, executive director of the Canadian Plant Technology Agency, notes that just because a variety goes off patent, other contracts and agreements may prevent a soybean grower from using off-patent Roundup Ready seed. The CPTA is a member-driven not-for-profit organization that supports intellectual property within the Canadian Seed industry. “There are several issues with the Roundup Ready 1 trait. There are still some varieties being sold as Certified seed that carries that trait, and it may also be stacked with other traits. These varieties may still be protected by some sort of grower agreement,” Hadley says. To avoid legal ramifications of using bin-run seed, growers should check to see if the variety can be legally saved and replanted. This may be the case for some very old varieties or some conventional varieties. However, while the patent on the trait may have expired, other forms of intellectual property protection, such as varietal patents, continue to be valid. Soybean growers may also have signed other contracts with seed companies where they are not allowed to save or trade seed between farmers. “There’s not a lot of upside to bin-run seed. The biggest risk is not knowing what is in the bag if you are purchasing it from someone else. For example, maturity is a big challenge for growers and you might be getting a variety that requires high heat units to mature that isn’t adapted to the area you farm,” Hadley says. It’s up for growers to decide whether they want to take that risk with bin-run seed or place a safe bet on Certified seed.